On February 21st, a CNN town hall about gun control was held in Florida. Throughout the event, teachers and parents of the victims of the recent Parkland, Florida school shooting questioned state legislators and an NRA spokesperson. But Parkland students arguably owned the discussion. Here are the highlights. When one senior asked why students had to lead the charge for gun reform. Ryan Deitsch began by saying that he had participated in active shooter drills even in elementary school. He recalled how, in fifth grade, he once hid with his classmates for three hours while his school simulated lockdown. And he connected the memory with hiding in a closet during the February 14th shooting. Deitsch asked why students were responsible for enacting change. "Why do we have to march on Washington just to save innocent lives?" he asked. Rubio agreed that students shouldn’t have to fight for their own safety. When Cameron Kasky asked Rubio if he would stop accepting NRA donations. Kasky, a junior, asked the Florida senator if he would stop taking NRA funding. When Rubio avoided answering Kasky’s question directly, the student persisted. Rubio again dismissed the question, saying that people “buy into” his political ideas. "In the name of the 17 people who died, you can't ask the NRA to keep their money?" Kasky asked, incredulous. "I bet we can get people to give you exactly as much money." Rubio again avoided answering Kasky. When Emma Gonzalez demanded that an NRA spokesperson answer her question. Gonzalez previously attracted attention for her stirring speech at a February 17th protest. At the town hall, she asked NRA spokesperson Dana Loesch if she supported restrictions on semiautomatic rifles and attachments such as bump stocks. Loesch gave a meandering response that discussed background checks. But Gonzalez wasn’t satisfied. "I think I'm gonna interrupt you real quick and remind you that the question is actually, do you believe it should be harder to obtain these semiautomatic weapons and modifications to make them fully automatic, such as bump stocks?" the senior repeated. Loesch continued to sidestep the question, but Gonzalez didn’t stop questioning her until Sheriff Scott Israel stepped in. 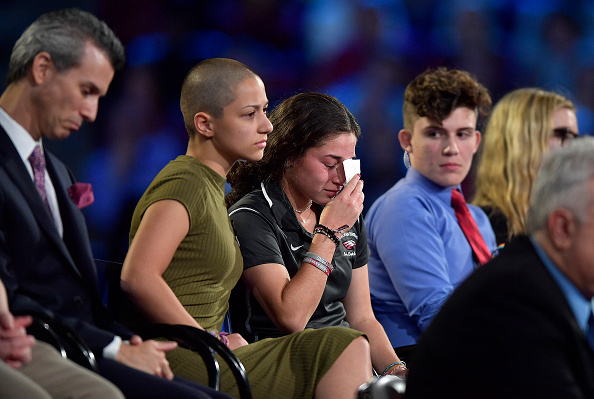 Even before the CNN town hall, we were in awe of all that the Parkland students have done to fight for change after facing an unimaginable tragedy. We stand with these survivors, now and always.